That there is a minimum charge of 5 days per booking, during school holidays the minimum charge is 7 days. Going on holiday and no - one to look after your chickens whilst you are away? Don't worry we offer a chicken boarding service for your chickens whilst you are on holiday. Your poultry will have exclusive use of their own Private Coop. 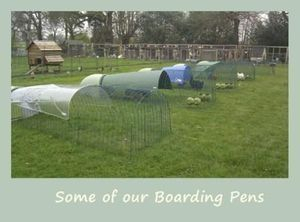 We only use plastic coops for boarding purposes as they can be thoroughly cleaned in between visits. Larger flocks? 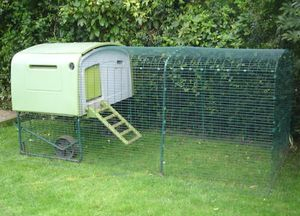 Not a problem we now have boarding coops and run designed for larger flocks - up to 30 hens can be accomodated in these coops & runs. These coops will accommodate up to 3 birds. With an extended 3m run they provide a perfect base for the hens holidays! These coops will accommodate up to 6 birds. With an extended 3m run they provide a perfect base for the hens holidays! Special offer If you have 4 birds we will provide the Cube at a reduced rate of £8.00 per day. Contact us for larger flocks and we can see what we can arrange for you. Often they can be split into two pens and kept adjacent to each other in our boarding field. Please note occasionally we need to alter these times but we will advise you of this on booking. We do our best to accommodate special requests for dropping off earlier and later but these requests cannot always be met. Arrival Day and Collection Day are chargeable. Xmas / School holidays - minimum of 7 days charge. A non-refundable deposit of 25% is required to confirm booking this should be paid within 48 hrs of booking request. PAYMENT IN FULL IS REQUIRED WHEN BIRDS ARE BROUGHT INTO BOARDING. Please be aware when booking to give us the dates that you need the birds to arrive and collect - This may not be your actual holiday dates - you may want to drop off the day before you travel and collect the day after? Fully sanitised coop on arrival - sanitised with Vet strength disinfectant. All feed / Grit / Corn / Water & Bedding will be provided. Birds will be cleaned out at least twice a week. They will be locked away each evening and let out in the morning. Shade will be provided as required. Classic & Cube Coops will be moved onto fresh grass every other day. PLEASE DOUBLE CHECK YOUR HOLIDAY DATES WHEN YOU BOOK YOUR BIRDS IN FOR BOARDING. IF YOU ARE LANDING ON THE 15TH AT 11.00PM AT NIGHT YOU WILL NEED TO BOOK THE GIRLS IN UNTIL THE 16TH!!! MANY PEOPLE HAVE BEEN CAUGHT OUT - PLEASE CHECK YOUR DATES. ALSO BE AWARE OF OUR DROP OFF AND COLLECTION TIMES. For terms and conditions of boarding please click here. Booking birds into boarding facilities assumes acceptance of our terms and conditions.